It will be difficult for a person living in the city or a township to understand life in Amadiba village in the Eastern Cape. Amadiba is a deep rural area in the OR Tambo District under Mbizana municipality. This is part of the area called the Wild Coast. The village is situated in a long, flat dry area of land. Most notable landmarks are beautiful hills with caves, rivers and streams that flow towards the sea. Driving in the village is a great experience - you follow the tracks made by cars that travelled before you. When a vehicle drives through the village, some children watch with great interest; others run back to their mothers in the rondavel houses. Families live as units far away from each other, but they know each other very well. It is all these features that attract tourists from all over the world to this land of the Amampondo people. In 1997, the people saw that tourists loved visiting their area. They started a community tourism project called Amadiba Adventure. Through this project, local people use their horses to take tourists for rides along the beach front, show them the rock caves in the hills and cultural activities in the village. Tourists are taken for visits to the sangomas, and to see waterfalls and animals. The project received money from Ntsika in the Department of Trade and Industry that helps people with money to start small businesses. In 2002, the European Union heard of the project. They asked the Department of Environmental Affairs and Tourism to identify similar projects in all the disadvantaged communities in the Wild Coast area. 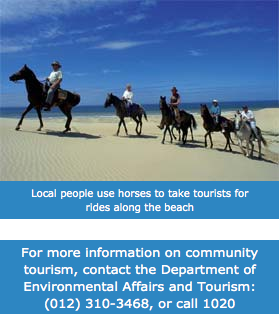 The Department is now running a number of community tourism projects countrywide. This helps to create jobs where there were no job opportunities before. The European Union donated R84 million to areas around the Wild Coast alone. A total of 300 community projects were started and 1 470 jobs created in the area. However, as time went by some of the projects stopped. The Amadiba Adventure project is one of the most successful projects. 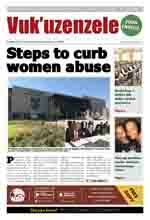 It received about R9 million from the money donated by the European Union. The money was used to train local people in tourism. The training included tour guiding, preparing traditional food for tourists and taking tourists on horse trails. Two bush camps where also built. Here, tourists enjoy Amampondo cultural dances, food prepared by villagers and story telling at night. The Amadiba Adventure Project has now developed into a Trust. This means the project belongs to the whole community and everyone benefits from the money earned.